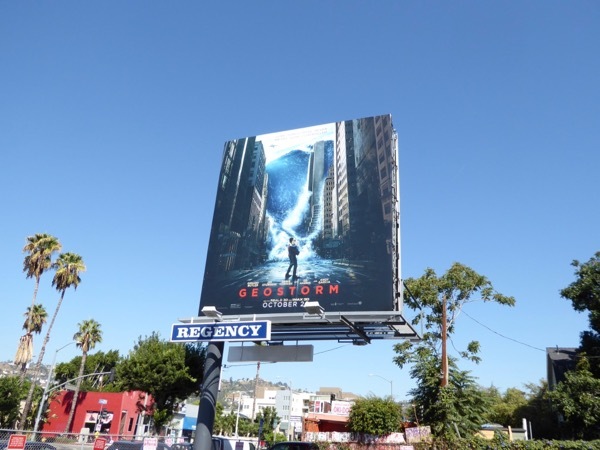 With America having been battered by some of the worst storms in history this year, with hurricanes and floods ravaging Puerto Rico, the U.S. Virgin Islands, Houston and Florida, now may not be the best time for a film called Geostorm to fill the city skies. On the other hand, some mindless popcorn movie escapism may just be what the public consciousness needs at the moment. 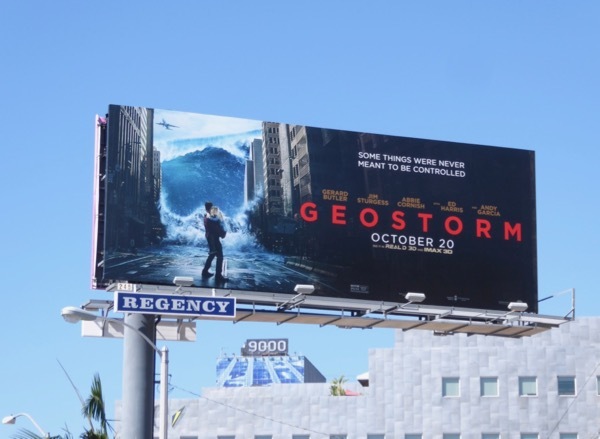 In Geostorm after a series of unprecedented natural disasters satellites are deployed in orbit to control the weather and global climate. Unfortunately like all the best laid plans something goes wrong and it's a race against time to save humanity from this man-made threat that was supposed to defend the Earth not obliterate all life on it. 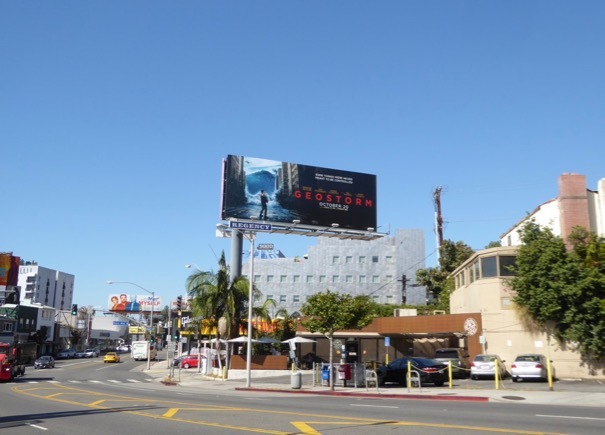 These billboards for the sci-fi disaster movie were snapped along the Sunset Strip, Fairfax Avenue and Beverly Boulevard from September 25 to October 4, 2017. 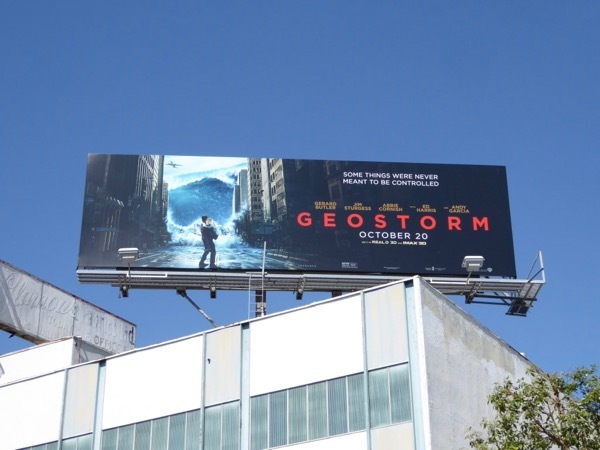 For more weather-related films, you can also check out these Into the Storm movie billboards and these Noah movie billboards. 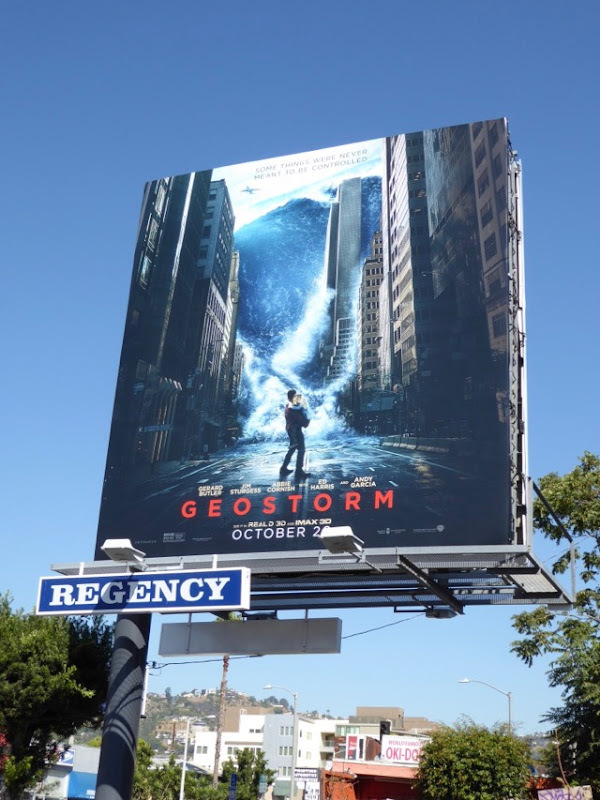 If you like to see gigantic tidal waves, killer tornadoes and wanton destruction on a grand scale, then this is the movie for you, meanwhile if you've actually lived through an experience like this then maybe you'll be giving this film a pass. Wouldn't it be nice if films like this and Only The Brave would consider donating some of their box office proceeds to help the rebuilding efforts of all the floods and fires that have assaulted the U.S. these past months, that truly would be an incentive for people to go watch these movies.